We have withus a compressions array of Barrel Heads suits for all type of Injection moulding machine barrel heads are produces with high quality of nitridede material with gas nitrizen and hard chorm plating. 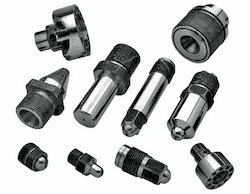 We bring forth vast industrial experience and expertise in this business, involved in offering high quality range of Injection Screw Barrel Nozzle Tip. Specifications:Material: Nitriding Steel, MS, 41Requirement- As per customers. With the help of our expert team members, we have been able to provide Barrel Head. Swedish std etc.We provide Hard welding strip to improve abrasion resistant of diameter of Head.We use EN 8, EN 19, EN 24, SAE 4140 steel to manufacture this head. We are engaged in offering Barrel Head. Our reputed entity is engaged in supplying Barrel Heads.